Located just outside the University of New Hampshire, Flag Hill Winery & Distillery is a hidden jewel in the inland seacoast region. Established in 1990 as a vineyard with the winery opened to the public in 1995 and NH's first distillery opened in 2004, this unique and scenic spot has seen visitors from around the world. The warm and inviting atmosphere in the Gift Shop & Tasting Room makes it fun and interesting to learn about the world of wine and spirits and enjoy tastes of high quality beverages. In our gift store, you'll find a variety of wine and spirit related items as well as many gifts, treasures and goodies made right here in NH. 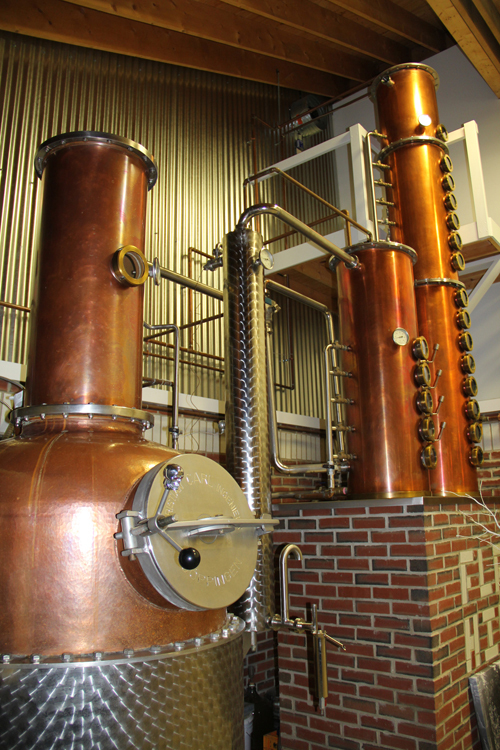 Plan ahead and come for one of our guided walking tours to hear about the history of land, growing grapes and to see the 150 gallon alembic pot still producing high quality spirits such as vodka, brandy, gin, rum, bourbon and liqueurs. Taste and learn about the difference buying a top shelf, high quality product can make. The Flag Hill post and beam dining room hosts dinners and events at least once a month between November and April, with extra special dinners for holidays such as Valentine's Day. Chef Lisa Blackburn prepares homemade, delicious dinners, brunches and more. Most dinners and events require reservations - check our online calendar for dates and reservation information. Flag Hill is also host to many private parties and corporate functions every year, including weddings ranging between 40-250 guests. Looking for a unique venue to hold your next catered event – check the Flag Hill web site for more information on our indoor and outdoor function facilities. Interested in learning more about Flag Hill? Visit our web site to sign up on our email newsletter list to hear about updates, new products, special savings, events and promotions. We look forward to seeing you at Flag Hill ! !